Sit back and wait for your free information! 5 Winners $50 gift card for Lakeshore Learning. All grades. This contest ends on June 10, 2019. 15 Winners Two friends band together with the help of their teacher to teach their classmates about different forms of gender expression and how to respect each other. Ages 4-8. This contest ends on June 10, 2019. 1 Winner Win an autographed book! This contest ends on June 10, 2019. 5 Winners This 6-book set covers a biome and its animals. Includes maps. This contest ends on June 10, 2019. 5 Winners Visual timer that helps you manage your classroom in 20-minute increments. All grades. This contest ends on June 10, 2019. 1 Winner A selection of our Teachers' Choice Awards for the Family 2019 winners valued at more than $590! This contest ends on June 10, 2019. 2 Winners DK Life Stories goes beyond the basic facts to tell the true life stories of history's most interesting people, and each book is developed in collaboration with a leading literacy consultant. Grades 3-7. This contest ends on June 10, 2019. 1 Winner At the ILA Conference 2019, you'll learn how to create and grow a thriving culture of literacy in your school, district, and community. Win a registration package valued at $300. All grades. This contest ends on June 10, 2019. 10 Winners In this new picture book by Geisel Medalist Greg Pizzoli, a book-loving hog gathers all the books he can find-but he doesn't know how to read! This contest ends on June 10, 2019. 5 Winners Peppa and her friends are using their imaginations to decide what to be in the new When I Grow Up DVD! Little ones will have fun playing pretend, helping others, and stepping on the stage for showtime with Peppa and her friends! Watch all 12 Peppasodes for lots of snorts and giggles! This contest ends on June 10, 2019. 1 Winner Win 30 copies of the book plus get a free book club kit. Grades 4-6. This contest ends on June 10, 2019. 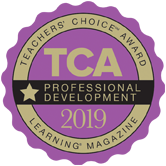 1 Winner A selection of our Teachers' Choice Awards for Professional Development 2019 winners valued at more than $145! This contest ends on June 10, 2019. Discover the inspiring stories of history's most extraordinary people with Life Stories. Go for the Gold and get the best classroom ideas The Mailbox has to offer! NEW! Brinsea Mini II & Maxi II Advance Educational Incubators & OvaScope. Watch your eggs hatch every time! The best barn owl pellets & support products available in the world! The one biology lab your students will never forget! The Book Hog: New from Geisel Award Winner Greg Pizzoli! Help your students SPRING into reading by inviting author and literacy champion Alane Adams to your school. Introducing Library Editions of Spy on History. These brand-new, library-friendly editions have puzzles built into the story, creating an interactive reading experience--no additional materials needed. New! Empower and support students with the Spring 2019 books from the American Psychological Association. Discover what's NEW! Thoughtfully designed teacher tools that boost skills--and get kids excited about learning. Come see Wikki Stix at AOTA, NSTA, ILA & NAEYC. What do your students want to be when they grow up? Get every little learner dreaming of a bright future with free adventures from Peppa Pig. The Mailbox ePackets: convenient, prepackaged activities for easy lesson planning! Be Internet Awesome with Google's digital safety lessons. The Mailbox School & District: your go-to classroom and activity resource! 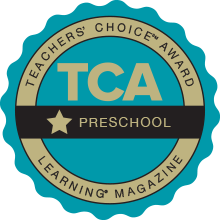 More than 52,000 effective teaching ideas and activities for grades Prekindergarten to 6. Develop online research skills with a trusted source! Exclusive, engaging, and age-appropriate content for today's students! New series! Focus on biomes and their animals. Loaded maps. Looking for a budget-friendly tape strong enough to hold artwork and posters that leaves no residue? TeachersTape can help! Removes cleanly and easily, comes in different sizes to suit your needs, and works on painted concrete, plastic, chalkboard, whiteboard, and glass! Celebrating 25 years of keeping classrooms on track, getting teachers through their day and helping students increase productivity and success. Learn how to create and grow a thriving culture of literacy in your school, district, and community--one that inspires and empowers all students. New Purpose+ Tables are perfect for play, learning, art, and more! Please complete the form below, including the grade you teach. Note: By providing your email address, you are authorizing The Mailbox, Learning, and their advertisers to send you information via email. used herein are trademarks or registered trademarks of their respective companies.
' // url : '/learning/contests-and-more' } --> Enjoy free materials and activities. Enter cool contests for awesome prizes. 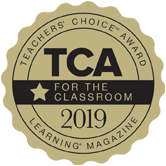 The winners for the 2019 Teachers’ Choice Awards programs are here! 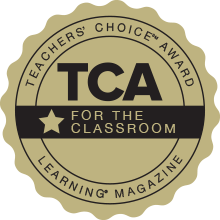 For 24 years, the Learning® magazine Teachers’ ChoiceSM Award for the Classroom has spotlighted the very best in classroom-tested, teacher-recommended products. Here are this year's top picks. Click on the categories below to view the winners. Contact Kyra Bilenki for more award information or to be added to our mailing list. Learning doesn’t stop when students leave your classroom! 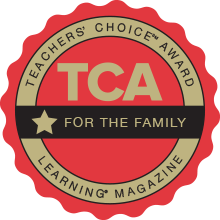 That’s why Learning® magazine hosts the Teachers’ ChoiceSM Award for the Family. Teachers who are also parents evaluated books, games, websites, electronics, and more to choose the best tools for at-home learning. The 13 winners are featured here. Finding just the right book brings the Common Core State Standards to life—and makes your lessons more fun! 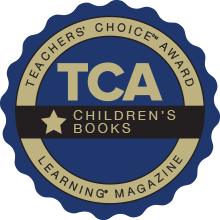 Learning® magazine presents the winners of the 14th annual Teachers’ ChoiceSM Award for Children’s Books. Lyrical verses present water in its many colors, shapes, and forms as it follows its natural cycle through the seasons. 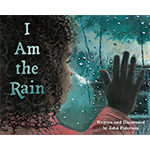 I Am the Rain includes STEM activities, water conservation tips, and more. PreK–grade 3, $8.95. Dawn Publications, bit.ly/2zEcp4D. How do we use our voices to be heard? 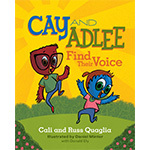 In Cay and Adlee Find Their Voice, the main characters meet new friends and listen and learn as they tell others how they feel, ask for help, and share their hopes and dreams. PreK–grade 3, $15.95. ASCD, bit.ly/2F9Ld3J. 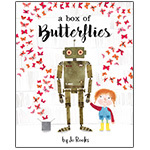 In A Box of Butterflies, Ruby and Robot introduce social-emotional learning and help children identify emotions. Ages 4–8, $16.95. Magination Press, bit.ly/2qAHamT. Zak has autism. He sometimes responds to the world around him in unconventional ways. 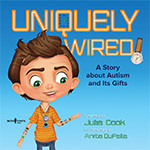 Uniquely Wired will help teach kids tolerance and acceptance when meeting children on the spectrum. Downloadable activities reinforce the lessons. 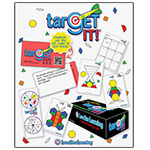 Grades K–6, $15.95. Boys Town Press, bit.ly/2SZmT7g. See Alexander Graham Bell’s telephone, giant squids, meteorites from Mars, and more with the Smithsonian Field Trips series. They’re like a tour of the Smithsonian in the form of a book! Grades 2–5, $31.80 for the series of four books. Capstone Press, a Capstone imprint; bit.ly/2JPrsgv. Toxic water. Killer smog. Nuclear accidents. 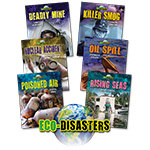 In the Eco-Disasters series, riveting stories and first person accounts uncover the truth about what caused these ecological catastrophes, their devastating toll, and the steps taken to remedy the problems. Grades 2–7, $159.60. Bearport Publishing Company, Inc.; bit.ly/2PKzoVH. 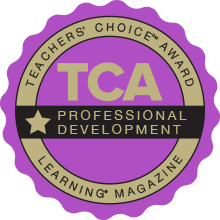 Tools to help you up your professional development game. Make the Genius Hour process meaningful. 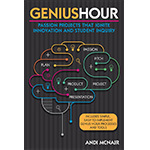 With Genius Hour: Passion Projects That Ignite Innovation and Student Inquiry, you’ll find an easy-to-follow strategy that uses the six P’s—passion, plan, pitch, project, product, and presentation—as a map for students. Grades K–12, $24.95. Prufrock Press, Inc, bit.ly/2Dw6e7d. The weekly Teaching Tolerance email newsletter covers timely issues. Stories spotlight topics such as activism and advocacy, gender studies, and the consequences of slavery. The newsletter also includes information on free resources, personal development workshops, and more. Grades K–12, free. Teaching Tolerance, bit.ly/2JNYFZL. Build achievement-boosting strategies into your everyday instruction. 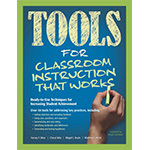 Tools for Classroom Instruction That Works: Ready-to-Use Techniques for Increasing Student Achievement provides more than 50 classroom-ready tools that make it easier. Grades K–12, $34.95. Silver, Strong & Associates With McREL International, bit.ly/2FaS1Op. Take an active role in child-directed play to guide learning. 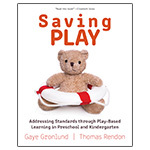 Saving Play: Addressing Standards Through Play-Based Learning in Preschool and Kindergarten shows how open-ended play addresses learning domains, including literacy, math, science, and more. Ages 3–6, $34.95. Redleaf Press, bit.ly/2PhNbUg. 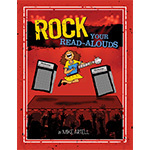 Read-aloud performers and storytellers share their methods and classroom-tested approaches in Rock Your Read-Alouds. You’ll learn dozens of innovative ways to take your read-alouds to the next level. 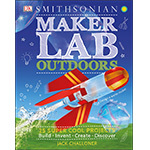 Grades K–5, $24.95. Maupin House by Capstone Professional, a Capstone imprint, bit.ly/2qAHxOj. 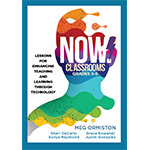 NOW Classrooms, Grades 3–5: Lessons for Enhancing Teaching and Learning Through Technology focuses on four essential skills—communication, collaboration, critical thinking, and creativity. The lessons enable students to exercise their voice, choice, and creativity using multimedia and digital tools. Grades 3–5, $29.95. Solution Tree Press, bit.ly/2zFPUfu. 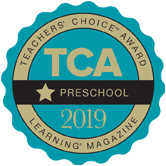 Preschool teachers, these award-winning products are for you! What kind of horse lives in the sea? Who is friends with the octopus? 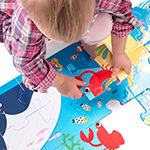 Kids meet the colorful creatures of the ocean depths as they assemble the 27 jumbo puzzle pieces in the panoramic Looong Puzzle Ocean. Ages 2 and up, $18.99. Banana Panda, Inc., bit.ly/2QoMdlr. Use this multipurpose activity tray for sand and water play, arts and crafts, light box activities, and planting. 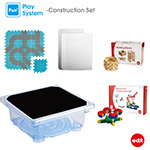 The Fun2 Play System–Construction Set includes 200 building blocks, 350 linking cubes, activity cards, and more. Ages 3 and up, $299.99. EDX Education Co., Ltd., bit.ly/2qAyo8g. Integrate story retelling activities across the curriculum to build your children’s skills in social-emotional development, numbers, STEM, and more. 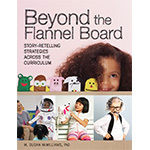 With Beyond the Flannel Board, real-life examples and activities show you how to easily integrate the teaching strategies into your everyday classroom routine. Ages 2–5, $29.95. Redleaf Press, bit.ly/2Dw5DT1. Everyone loves bubbles. 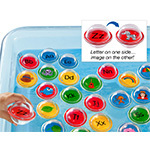 Float & Find Alphabet Bubbles are watertight plastic bubbles that show an uppercase and a lowercase letter on one side and an image representing the matching beginning sound on the other. Ages 2–6, $29.99. Lakeshore Learning Materials, bit.ly/2PllEBt. 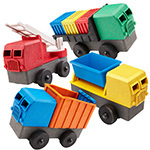 Luke’s Toy Factory Educational 4 Pack includes four trucks that are simple 3-D puzzles. The puzzles have built-in wiggle room so kids with developing motor skills don’t get frustrated. Ages 3–6, $69.95. Luke’s Toy Factory, bit.ly/2SUNSkx. Give kids an up-close view of magnetism in action with the translucent See-Inside Magnetic Blocks. 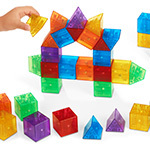 The set includes 36 durable plastic blocks in two shapes and six colors. Ages 3–11, $69.99. Lakeshore Learning Materials, bit.ly/2DaziQv. 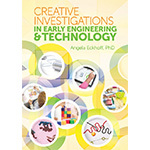 Promote participation and create a well-rounded STEM learning program with the activities in Creative Investigations in Early Engineering and Technology. Ages 4–6, $16.95. Gryphon House, Inc., bit.ly/2JV4Ew1. Let Garfield teach children how to be safe and secure online. Garfield’s Cyber Safety Adventures has a series of three lessons that cover privacy, safe posting, and cyberbullying. Grades K–5, $150. Center for Cyber Safety and Education, bit.ly/2FdmwDs. 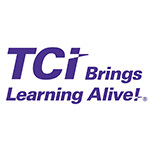 The TCI Social Studies Alive! online interactive social studies programs teach students about the world around them. Grades K–5, prices vary. TCI, bit.ly/2DbCgEv. Students focus on forests to learn about the interactions present in all ecosystems. 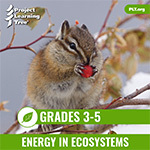 The Energy in Ecosystems online unit provides step-by-step lesson plans, online video demonstrations of the activities, assessment tools, and more. Grades 3–5, $40. Project Learning Tree, bit.ly/2zCflyy. 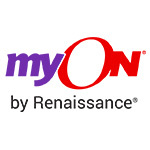 Renaissance myON Reader matches students with books aligned to each student’s interests and reading level. This student-centered, personalized literacy platform offers unlimited access to thousands of enhanced digital books. Grades K–12, $6,950 for one school. Renaissance, bit.ly/2zCbPUN. 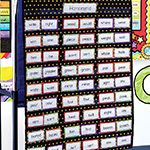 Take control with this dual-function classroom management system. 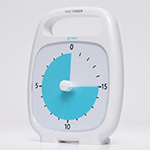 The timer mode allows you to add structure and focus to tests and timed activities while the noise mode alerts students when they are being too loud. All Grades, $99.95. Primary Concepts, Inc., primaryconcepts.com, http://bit.ly/2bmNQgX. 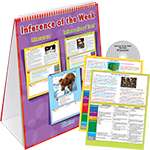 Build close reading skills with this comprehensive flip chart that lets you explore essential inference types across 20 different genres. Grades 3–8, $39.99. Really Good Stuff, LLC; ReallyGoodStuff.com, http://bit.ly/2ffpetI. In this game, students team up with the detectives from the Owl Solve That! agency to use addition, subtraction, multiplication, and division to create an equation that matches the solution card in their hands. Ages 10 and up, $30. SimplyFun, bit.ly/2RJaKC1. Build 2-D and 3-D circuits—from a lantern to a spinner—or let kids design their own creations with the Power Tiles Circuit Kit—Master Set. The interchangeable circuit tiles snap together in every direction. Ages 6–10, $149. Lakeshore Learning Materials, bit.ly/2OxP0qQ. Make classroom review simple for you and fun for students. The new TarGET IT! math review game includes 300 question cards arranged by color to make targeting specific objectives easy. Grades 2, 3, 4, and 5; $49.99 for each game. Lone Star Learning, Inc.; bit.ly/2SUCXat. Proof! is a fast, fun, and addicting math game. 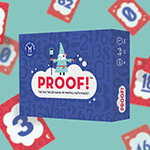 Players compete to find an equation among the nine number cards on the table and shout out the result before anyone else. Ages 9 and up, $14.99. The Master Theorem Games, bit.ly/2RIrBFb. Establish a thinking-centered classroom with the instructional strategies in this guide. Teachers of all grades, $12.95. Mentoring Minds, 800.585.5258, www.mentoringminds.com, http://bit.ly/1OzN5OL, http://bit.ly/2eLFy4B. Don’t second-guess whether or not there’s ink left in your marker. EXPO Dry Erase Markers With Ink Indicator and a clear barrel make it easy to see how much ink is left. Ages 3 and up, $24.08 for a set of six. Go teach! at Newell Brands, bit.ly/2zyH82M. 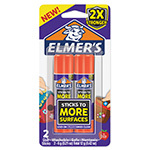 For arts and crafts projects that go above and beyond, Elmer’s Extra Strength Glue Sticks (6-gram size, pack of two) work on more than just paper. Ages 3 and up, $1.99 for a set of two. Go teach! at Newell Brands, bit.ly/2DzTufA. 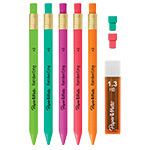 Designed with kids in mind, Paper Mate Handwriting Mechanical Pencils feature thick lead for less breakage, a triangular shape that guides finger placement, and bright barrel colors. Ages 3–8, $3.49 for a set of five. Go teach! at Newell Brands, bit.ly/2OxjHfV. 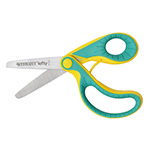 Developed to relieve effort and frustration, Westcott Kids’ 5-Inch Ergo Jr. Lefty Scissors with a blunt edge have been kid-tested for fit, comfort, wrist posture, control, and accuracy. Ages 4 and up, $3.99. Acme United Corporation, bit.ly/2DscJrB. Take your displays from dull to dazzling. 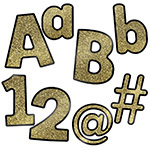 The Sparkle + Shine Gold Glitter Combo Pack EZ Letters set includes uppercase and lowercase letters, numbers, punctuation marks, and symbols. All grades, $12.99 for 219 pieces. Carson-Dellosa Education Group, bit.ly/2QuvsW4. 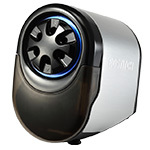 The Bostitch QuietSharp Glow Electric Pencil Sharpener blends performance, safety, and style. The motor delivers quiet operation and faster sharpening speeds, and the SharpGlow illumination provides a visual indicator when sharpening is completed. Grades K–12, $69.99. Amax, Inc., d.b.a. Bostitch Office; bit.ly/2z7VnMX. Light up the room with the Sparkle + Shine Essential: Gold Polka Dot Pocket Chart. It’s embellished with metallic gold polka dots and features 10 clear pockets and one storage pocket. All grades, $24.99. Carson-Dellosa Education Group, bit.ly/2zDeTAh. 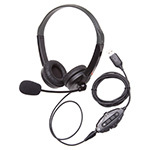 Students get an immersive and realistic experience with surround sound using the GH131 Gaming Headset. Grades 2–6, $55.99. Califone International, LLC; bit.ly/2Dae9FW. 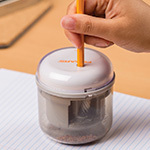 Have the sharpest pencils in the box with the new Fiskars Battery-Powered Pencil Sharpener. It uses eight steel blades that work together for optimal sharpening. All grades, $19.99. Fiskars Brands, Inc.; bit.ly/2AV6Dxv. 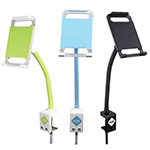 HUE Flexible Tablet Stand enables you to use tablets in new and creative ways, including for stop-motion animation, time-lapse photography, and more. Grades K–12, $49.95. HUE, bit.ly/2z07jQN. HOT Skills: Developing Higher-Order Thinking in Young Learners provides numerous strategies for promoting higher-order thinking across the curriculum. You can easily modify the strategies to meet varying learning abilities, styles, and intelligences. Ages 4–8, $39.95. Redleaf Press, bit.ly/2F9j0Kl. Students substitute phonemes to make new words with Word Ladder Card Sets. You’ll get three sets of self-checking dry-erase cards. Grades K–2, $59.37. Really Good Stuff, LLC; bit.ly/2z07pb7. The Bee Book shows you how to create a bee-friendly garden, get started in beekeeping, and harness the power of honey for well-being. Ages 5–8, $15.99. DK, bit.ly/2qA0DEb. Ages 3 and up, $649.99. Brackitz, bit.ly/2D7DWid. 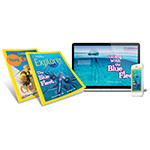 Inspire your students to read with the storytelling, exploration, and photographs in National Geographic Explorer Magazine. A subscription provides seven grade-specific issues, teachers’ guides, and content aligned to reading and science standards. Grades K, 1, 2, 3, 4, and 5/6; subscriptions start at $3.75 for one student. National Geographic Society, bit.ly/2JQDjuH. 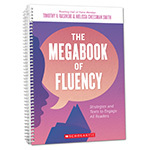 Weave fluency work into your daily reading instruction with the tools, assessment scale, and ready-to-use lessons that include text phrasing and tonality echo reading, word ladders, and more in The Megabook of Fluency: Strategies & Texts to Engage All Readers. Grades K–8, $46.99. Scholastic, Inc.; bit.ly/2yXZieO. Instant Workstations: Genre Studies With 30 Paired Passages gives students practice developing a deeper understanding of different literary genres using paired passages. Grades 1, 2, 3, 4, 5, and 6; $39.99 for a grade-level set. Newmark Learning, bit.ly/2Dsd0L9. 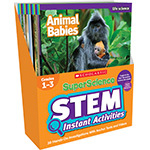 From food webs to fossils and earthquakes to energy, SuperScience STEM Instant Activities kits feature 15 topics that support Next Generation Science Standards. Each topic comes with anchor texts and links to an online video. Grades 1–3 and 4–6, $49.99 for each kit. Scholastic,bit.ly/2qyksf6. The Red Rocket Readers Rainbow Explorers and World Explorers collections for emergent-level readers provide an introduction to first concepts and feature controlled language. There are eight titles in each series. PreK–grade K; $7 for one book, $56 for one copy each of eight titles, $112 for one copy each of all 16 titles. Flying Start Books, Ltd.; bit.ly/2Dc1e6J. You don’t need to be an engineer or a scientist to support STEAM learning. Use the activities in the book Simple STEAM to help children explore STEAM concepts in everyday activities and experiences. Ages 3–6, $24.95. Gryphon House, Inc.; bit.ly/2AV5LZx. Launch young learners into literacy with Red Rocket Readers Collections. 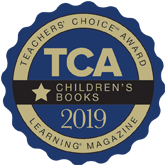 This reading program offers more than 600 illustrated fiction and photographic nonfiction titles at grade-specific levels. Grades K–2, $25 for a single copy. Flying Start Books, Ltd.; bit.ly/2FaM5Fd. 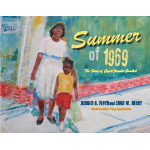 Summer of 1969 tells the story of Cozett Juanita Gambrel Floyd, whose mother spent the summer of 1969 preparing her daughter to face the challenges of entering a new school during desegregation and being the only black child in her class. Grades 1–6, $16.99. Integrity Time, LLC; bit.ly/2RHhjFu. Construct a working model of tectonic plates. Build a telescope. Use these interactive projects, and the others in Maker Lab: Outdoors to inspire kids’ creativity and their scientific side. Ages 8–12, $19.99. DK, bit.ly/2DtTvBK. Keep short routines on track with the Time Timer PLUS 5 Minute timer. It’s designed for quick activities, such as brushing teeth, breathing exercises, and brainstorming. All ages, $41.45. Time Timer, LLC; bit.ly/2PhJ8Hn. Sometimes an hour is too much time. The Time Timer PLUS 20 Minute timer makes it easy to visualize how quickly 20 minutes will go by. All ages, $41.45. Time Timer, LLC; bit.ly/2yYZDhp. 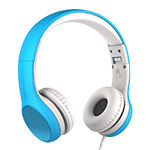 Bold colors, clear sound, comfortable fit, and limited volume make the LilGadgets Connect+ Style Children’s Headphone a hit with parents, teachers, and kids. Ages 3 and up, $22. LilGadgets, bit.ly/2PJJPJa. Hungry forest friends need help. Students spin the spinner, then place the matching colored acorns in their logs. The Sneaky, Snacky Squirrel Game teaches matching, sorting, counting, and simple math skills. Ages 3–5, $21.99. Educational Insights, bit.ly/2SWMDS4. Introduce preschoolers to computer coding with a hop, skip, and a jump. 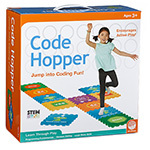 This active game, called Code Hopper, gives young brains insight into sequencing, decision making, and following commands, while keeping little bodies busy. Ages 3 and up, $24.95. MindWare, bit.ly/2qCnLli. Get ready for intergalactic exploration. 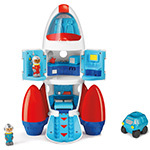 The rugged Play & Explore Rocket features three levels, including a control room that holds two astronauts, a living space, a garage for the included rover, and more. Ages 3–7, $39.99. Lakeshore Learning Materials, bit.ly/2SWIyx8. Bring fairy land—and children’s imaginations—to life. 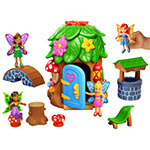 The durable Fairy Land plastic playset includes four poseable fairies, plus everything you need to make them feel right at home. Ages 3–7, $39.99. Lakeshore Learning Materials, bit.ly/2RJ9jUa. 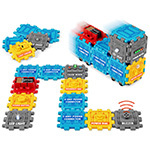 Botley the Coding Robot Activity Set teaches the basics of coding through active play. It’s completely screen free—no phone or tablet required. Ages 5 and up, $79.99. Learning Resources, bit.ly/2RDS46K. 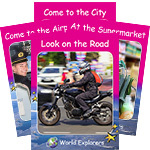 Little globetrotters get to explore the world, one country at a time, with a Little Passports, World Edition subscription. The monthly packages include online learning games and activities, recipes, souvenirs, photos, and more. Ages 6–10, $12.95 a month for a one-year subscription. Little Passports, bit.ly/2PP9lwo. Make your students the stars of educational videos, books, games, and more. Ages 2–7; free sample content, $4.99 a month for unlimited access to the content library. JibJab Media, Inc.; storybots.com. 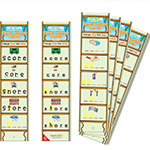 Easy-to-learn, super speedy game play shifts kids' vocabulary skills into high gear. Ages 7 and up, $19.99. Educational Insights, Inc.; educationalinsights.com. This twist on tic-tac-toe expands the board to four rows and adds another dimension. The result is a game that is both familiar and simple, yet demands careful planning. Ages 8 and up, $16.99. Accomplice Productions, LLC/Melissa & Doug; ticstactoe.com. Race to save the animals. A portion of the profits from this wildlife conservation board game benefit education and wildlife conservation organizations. Ages 8 and up, $44.95. Traveling Animals, Inc.; traveling-animals.com. 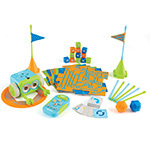 Keep little ones entertained in a big way with a pretend-play remote that introduces numbers, shapes, and first words. Infant to age 3, $12.99. LeapFrog, 800.701.5327, leapfrog.com, http://bit.ly/1NbiIwC. Six sets of interactive learning cards focus on developing children’s skills in alphabet knowledge, phonemic awareness, sight words, phonics, vocabulary, and word work. Ages 3–7, $169. Lakeshore, 800.778.4456, lakeshorelearning.com, http://bit.ly/1NbiJ3u. This book provides a new, more helpful and less stereotypical understanding of those diagnosed with autism and how to best support their development. Ages 15 and up, $15.99. The Integrative Multi-Treatment Intervention program for autism, JAlderson.com. Bugs fly, hop, and slide across the pages of this book, which is meant to be read lying on the grass. Ages 3–8, $8.95. Dawn Publications, dawnpub.com. Jokes about fruits and veggies make this a silly storytime trip to the farm market. Ages 3–8, $7.99. Experience Early Learning Company, experienceearlylearning.com. 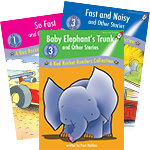 This set of books features clear, concise, kid-friendly text and bright full-color photos. Grades PreK–2, $63.60 for eight titles. Capstone Press/Capstone, capstonepub.com. Innovation and imagination are on full display in this guide. It explores how new technologies are shaping the modern world and the future. Ages 8–12, $24.99. DK, dk.com/us. Learn about the history of iconic American landmarks—including the Statue of Liberty, the Golden Gate Bridge, and the White House—from concept to completion. 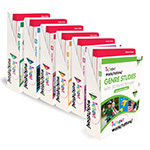 Grades 2–7, $119.70 for six titles. Bearport Publishing Company, Inc.; bearportpublishing.com. 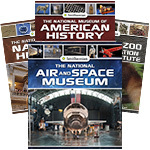 This four-book set combines nonfiction text features with engaging stories. The set meets standards for analyzing multiple accounts of an event. Grades 3–6, $34.80 for the set. Capstone Press/Capstone, capstonepub.com. Meet Mary Bowser, an African-American spy who infiltrated the Confederates' highest level of leadership. Readers use spy craft materials in the book to solve a mystery. Grades 3–8, $12.95. Workman Publishing Co., Inc.; workman.com. This rhyming tale of 12 teddy bears tumbling from page to page teaches counting, colors, and shapes. Ages 3–6, $7.95. Charlesbridge, (800) 225-3214, www.charlesbridge.com. From the market to the museum, math is all around us. These books help teach children how to understand their world in numbers and shapes. PreK–grade 1, $41.93 for the seven titles. 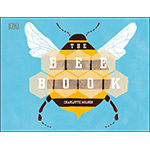 Heinemann-Raintree, a Capstone imprint; (800) 747-4992; www.capstonepub.com. Information without organization can be confusing. Matt Maticus helps readers learn about sorting, graphs, data analysis, and probability. Grades 1–3, $27.80 for the four titles. Capstone Press, a Capstone imprint; (800) 747-4992; www.capstonepub.com. This story provides a helpful reminder to all children that sadness is a temporary feeling. Ages 3 and up, $15.95. Redleaf Press, 800.423.8309, redleafpress.org, http://bit.ly/1jmEiVm. Free children from the stereotypes associated with skin color and help them build positive identities. This book offers a simple, accurate explanation about how skin color is determined by our ancestors, the sun, and melanin. Ages 3 and up, $15.95. Redleaf Press, 800.423.8309, redleafpress.org, http://bit.ly/1jmEiVm.